Making it's debut in the Fall of 2011, Bandana is a small batch blend that is being released as a limited edition through select vendors. AKG always has its ears to the ground, and what they heard the customers asking for was this hybrid. Taking the famous 707 Headband clone and crossing it with their already proven Snowdawg BX male, they created a new hybrid that adds the Headband size, CBN profile and a bit of skunk/diesel flavor to the Snowdawg structure and sweet aroma and taste. Test grows indicate a strong tendency to stretch during the early stages of flowering, sometimes up to 3x. What starts in flower as 3ft will often end up pushing 7ft. The Headband genetics sometimes show through in certain phenotypes creating a weaker branch structure. 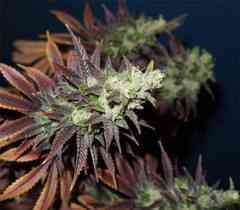 You will want to stake heavily and tie up early and often as the buds get very heavy and will want to droop. Medical Conditions: Cerebral Palsy, MS, MD, Chronic Pain, Spasms, Intestinal Pains (IBS, Crohns'), Rheumatoid Arthritis, Lupus, Parkinsons' Disease.